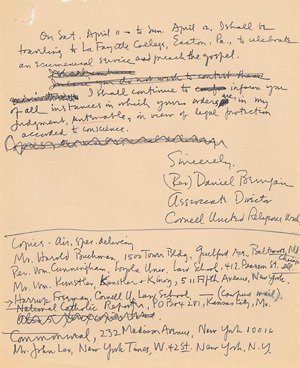 In response to U.S. District Attorney for Maryland, Stephen Sachs' order forbidding him to travel, Daniel Berrigan writes a letter to Sachs where although finding the order untanable, he informs him that he cancels his cultural and political engagements, but refuses to cease traveling for the purpose of the ministry of the Gospel. He includes a list of his ministry engagements for the next few weeks. an ecumenical service and preach the Gospel. Mr. Harold Buchman, 1500 Tower Bldg., Guilford Ave., Baltimore, Md. Rev. Wm. Cunningham, Loyola Univ. Law School, 41 E. Pearson St., Chicago, Ill.
Harrup Freeman, Cornell U. Law School - (Campus mail). Catholic Reporter, PO Box 281, Kansas City, Mo.